August 16, 2015 June 23, 2016 by Maja Todorovic, posted in Business in Rhyme, Read, write, lead!, Write, create, innovate! For many years I had the opportunity to live in the Hague, the Netherlands and it is one of the most diverse cities, where cultures, ethnicity, religion and human rights mix together, forming a unique atmosphere and living conditions. 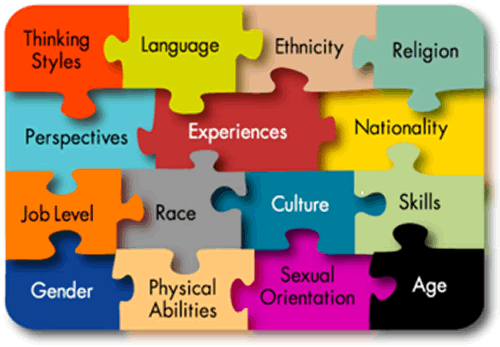 Diversity is a major topic and I’ve been always intrigued to which extent it governs our everyday life – especially if we work and live in diverse community. In addition to creating a workplace inclusive of race, gender, and sexual orientation (to name a few), many organizations are seeking value in something even simpler, diversity of thought. In some industries that are known for being insular – think law or high-tech companies – seeking out talent with different thinking and problem solving backgrounds is critical. It is very important issue since it influences how we perceive ourselves and others. And as with every other issue, this one can have advantages and drawbacks that can affect our work life. Some of the positive things might include different points of view, greater adaptability to changing conditions and a larger scale of skills and experiences within the organization. But often there are communication problems that can distract smooth interactions among the coworkers – which is prerequisite for timely and effective execution of projects. Ways and manners of managing diversity at workplace has become a hot topic and a lot of tools have been developed in order to bridge cultural gaps that diversity brings. In the paper “Use of Poetry to Facilitate Communication about Diversity: An Educational Model”, authors suggest that we can effectively use poetry as a tool to facilitate communication channels among diverse and culturally challenged groups. They propose a workshop (that they tested in the following example) where the main materials for discussion are different poems from ethnically diverse poets and poems that relate to women’s issues. Proposed workshop would begin with selecting a burning diversity topic that participants would like to discuss. Workshop facilitator afterwards chooses a poem congruent with issues that arose and a volunteer would read a poem. Participants in the group later discuss and talk about the poem. Afterwards, participants would write their own poems, while they were also encouraged to read their poems in front of the group with the follow-up conversation. The workshop would end with the creation of collaborative poem, in which each member of the group was invited to contribute with one or more words. Proposed time of the workshop: 3-4 hours, depending on the number of participants. Workshop resulted in increased innovation, independence, self-discovery, sharing opportunities and collaboration. To measure these results, the Group Environment Scale was used to assess workshop effects on group dynamics. According to the workshop feedback many participants adopted increased understanding of how gender and cultural issues may affect others. The research findings seem to indicate that the model’s interweaving of cognitive and effective elements has potential for creating changes among the individual’s perception of other cultures….metaphor can be especially instrumental in achieving this integration. What are your thoughts on diversity, equality and inclusion? Can poetry be of any help? Great choice of poem to illustrate the concept of diversity – I love Maya Angelou. I like her too. She was an extraordinary women – just as her poems are. I have recently been published in the Journal of Medical Humanities- the first time a patient has been published there. Keep up your good work and I would love to know more about the work you around this. Great article! Poetry is seen inneveery culture so how better to bring different cultures together than by use of poetry! Excellent post….very innovative way to explain this concept. Thanks! Apparently, poetry has that magic power somehow to “soften” our sometimes rigid points of view. I think it’s a great tool for mediation too. Indeed – however, some organizations have become toxic, they can’t think differently – bottom line matters more than people. Very true…Your posts deserve more recognition. Keep them coming. Excellent concept for encouraging diversity and creativity. Thank you for taking the time to visit my artist blog. I appreciate it. I also enjoyed your poem. You have a new follower. You are very talented and I’m glad I discovered your work 🙂 and thank you for visiting my site – it’s much appreciated! Most welcome, I liked your post. I like your avatar; it’s pretty. Great post. Thoroughly enjoyed reading this. So glad I found your site. I shall return! Hi Randy, nice to meet you. It was pleasure reading your blog and I’m glad you found something of interest here. :)Thank you! Reblogged this on Diary of a person who does not matter (to others). 🙂 thank you for your comment and reading the post! This is beautiful. Very beautifully penned down. Reblogged this on Therese's random blurbs. Really like your blog post, thank you for stopping by my blog and liking inseperable friendship. What a good idea! Something serious and ernest being tackled through Playfulness! This idea of Playfulness is very powerful. You could start a Writing group now on the back of this. There are if you needed some help with this some nice Apps as kickstarters for poetry in the Apps store. Worth exploring. Or simply sending out some one line suggestions like this – these are taken from one of these apps. Set some ‘rules’. Write a line no longer than seven words. You can add lines, change lines, link lines. Write less rather than more. Write a line containing the word “river”. We are so very much the same! We take these minor insignificant variations and give them such weight and power! Why? Good question. Human nature is strange, that’s for sure. One day when I have my own classroom, I’m going to share this with my students. I love this! Brilliant poem. Thank you for liking mine (Festive Food). Merry Christmas.